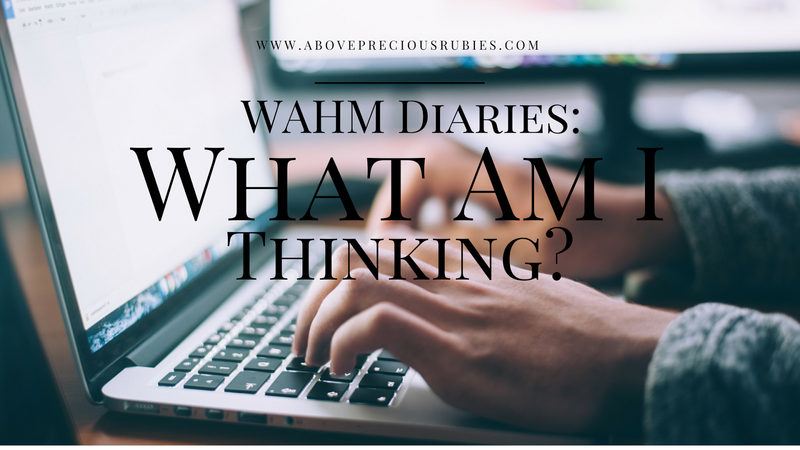 WAHM Diaries: What am I Thinking? Time check is 12:40 AM, March 20th, Monday. I just got off the phone with Dane. We had a little “tampuhan” and I’m happy it’s finally settled. We talked for about an hour and now he’s prepping to go back to work. The weekend so busy for all of us. As I write this, I recall what we did during the weekend. I like to start with what happened last Friday. I was with Nate and my sister, Ashiel in the Philippine Heart Center to visit our missionaries. A baby named Rowen Heath is currently confined there because of a congenital heart disease. The doctors performed a surgery last Thursday and he is now recovering. He is one (1) week old. Three things about this occurrence: the strength that baby Rowen’s family is showing is unimaginable. They have stayed strong despite this very challenging time. Second, the power of prayer. Everyone is praying for baby Rowen and is waiting for an update online all the time. The surgery that was expected to last for 12 hrs only lasted for about 8 hrs – I believe that is not luck, it is the power of God and the prayers of our co-believers. Third, life is too short – it can be taken away from us anytime. So we should try to make the most out of it. At the workshop, I learned about taming toddler tantrums. I’m happy I tagged Nate and my sister along. I’m happy to meet the other mommy bloggers during the event too. I was with Reylen, Lally, Berlin, Neri and Michelle (whom I met for the first time). I will talk about this more in a separate post. Baby Rowen’s dad, Robby and his grandpa, Ptr. Ben Anderson (our International Director for Things to Come Mission, Inc.) worshiped with us in the church today and everyone was a happy camper. Rob preached about the importance of working together as a team to do the work of the Lord. And for someone who has a son currently confined at the hospital, I don’t know if I can still preach an encouraging message like that! But Rob did, and we praise God for his life. I went home tired and exhausted since I woke up at 4 am to review the lesson that I would teach the Young People during our Sunday School. Then we brought a lot of stuff home since we bought stuff in the market. I had a mild headache when I was in the tricycle so I slept immediately when we got home. I woke up at around 9:30 PM and talked to Dane. -there are still genuine people who are willing to help. -dealing with a toddler is not easy but is fulfilling. -there’s no ‘one man work’ in the ministry. Teamwork plays a very important role. -confront any issues with your spouse. -forgive and remind each other of your love again. That is it for now. Time check is 1:10 AM. Hello sis! It's nice meeting you last Saturday! Sana lang marami pang events na makakasama ko kayo kaso malapit na akong manganak eh. Haha! Anyway, your weekend is so productive. Ang dami mong na-accomplish over the weekend. I got a little bit sad reading the first part of your post, though. But God is good all the time. I'll be praying for baby Rowen and his family, too. Prayer works wonders and miracles. That's how amazing our God is, diba? Tampuhan is very common is marriage but nice to know na okay na rin kayo. Yes, forgive, move on and love again. 🙂 Sometimes, when I have so many things to do din, parang gusto ko hatiin katawan ko para mapuntahan na ng sabay-sabay. hehehe! I feel so sad about Baby Rowen. I hope he will be able to recover fast from the surgery. Anyway, I was supposed to join the Smart Parenting workshop too but when the invitation came I had already said yes to attend a party. Sayang, would have been nice to hang out with you guys. I really admire them too! See you in the future events sis, I'm sure there's going to be more, after youg ive birth. Thanks for praying, sis! They need it so much. I hope too! Last update we had yesterday was kind of sad because they were still unable to stitch the heart back 'coz his heart rate slowed down. I remember our head pastor in our Alabang church before. His son died but he chose to praise God at the pulpit even during his season of grief. We grieved with him. Praying for baby Rowen. I agree, the miracle of cutting short surgery by 4 hours is only by God's amazing grace. Thank you! And they are such an encouragement to us also. It really is! And yes, hats off to these church workers who can still praise the Lord no matter what. Those are beautiful realizations about life. Yes, it is short, and we ought to make the most of each second to love our spouse and our children to best of our abilities, to extend help especially to those in need, and to inspire hope, faith, and love in others as much as we can. I completely agree with you on that!